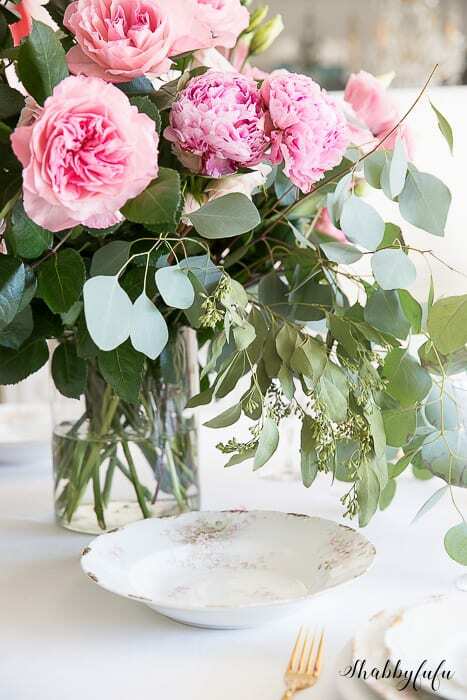 Finding simple Valentine Day Table Decorations with no red is possible and simple! All you need is a little bit of creativity to make it happen! 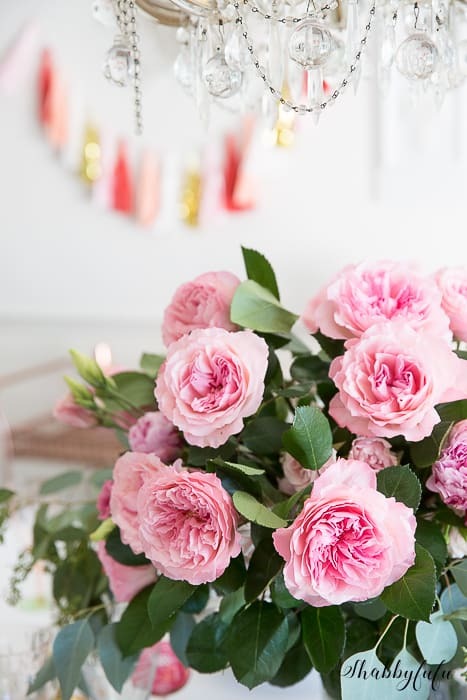 Let’s talk about simple…and romance…and flowers. 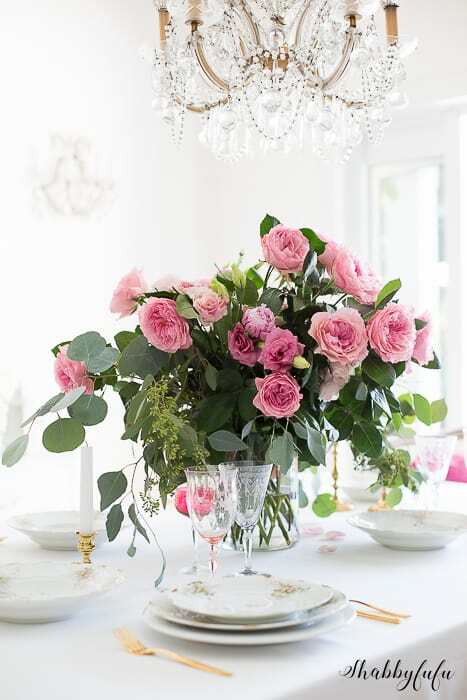 To me, all that is needed these days to create a beautiful table is a bucket full of beauty. 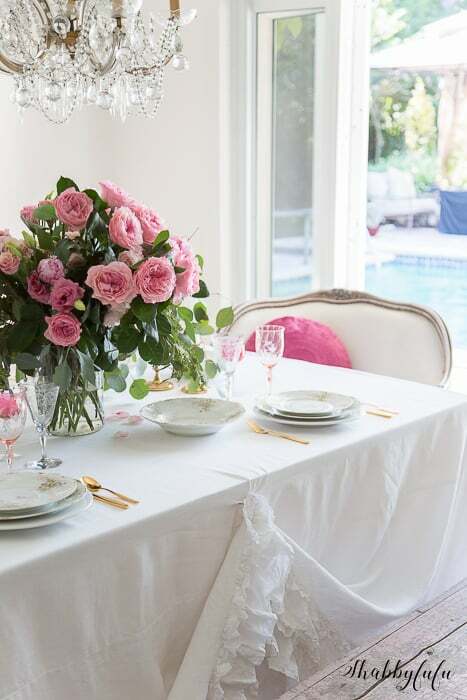 With the upcoming day of love, creating a beautiful table without the color red is possible! 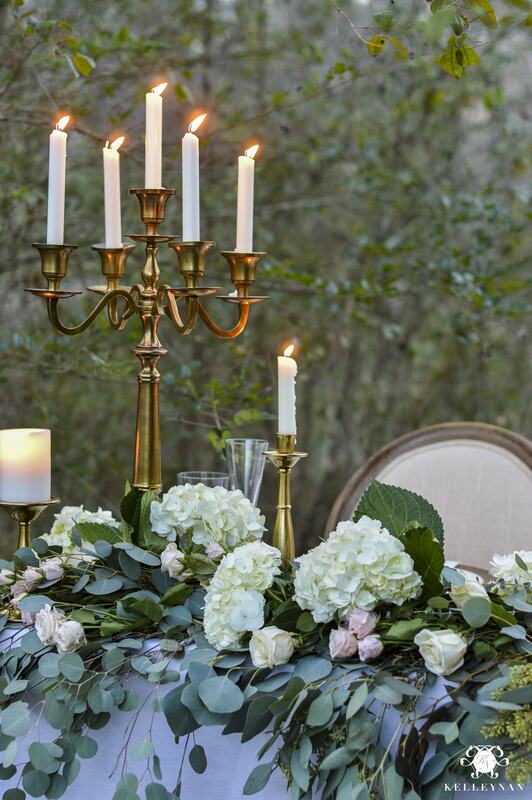 I’m super excited to share my table that is set as a dress rehearsal for a Valentines Day intimate dinner party. 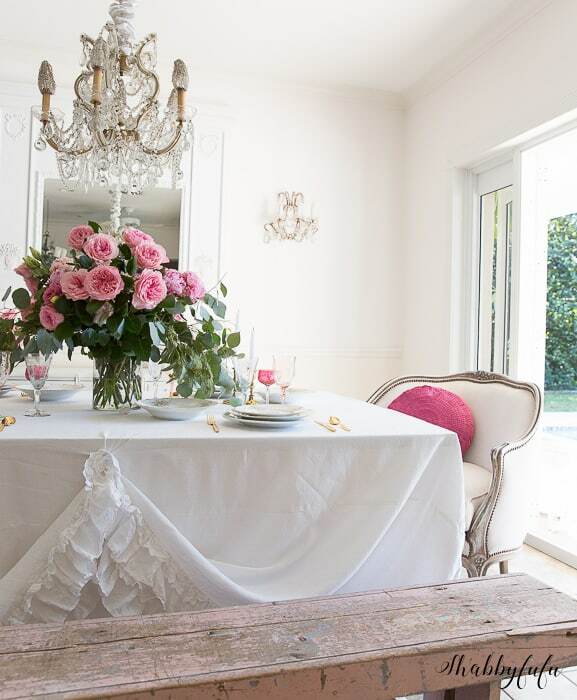 It’s simple with white and pink. 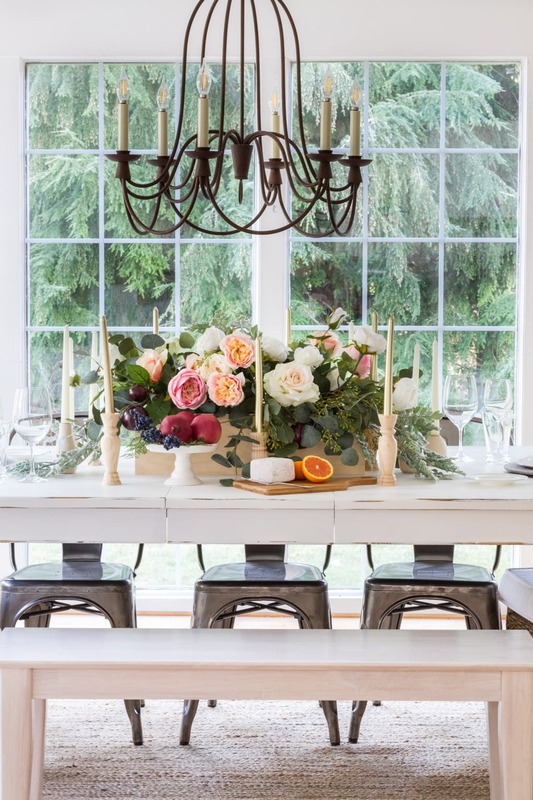 Welcome to the Styled & Set party hosted by my friend Lory of Designthusiasm and if you’re coming here from Driven By Decor I’m so glad that you are here! Two of my favorite colors for years and years are white and pink. And since I’m wholeheartedly embracing the “less is more” approach to life and home these colors remain true to what I love. Truth be told I’m really not much of a fan of red…I am of pale and pastels. That’s what I tend to go for almost every. single. time. 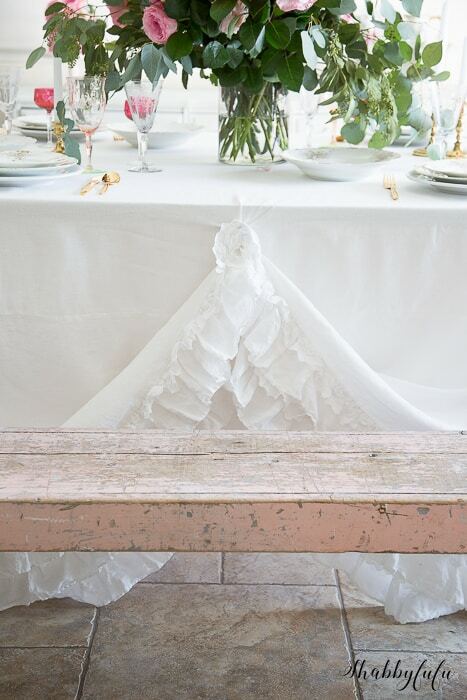 I started dressing my table today with this beautiful tablecloth that isn’t a tablecloth. You’ve SEEN IT BEFORE and I’m obsessed with it and have THIS DUVET COVER in both white and PALE BLUE. 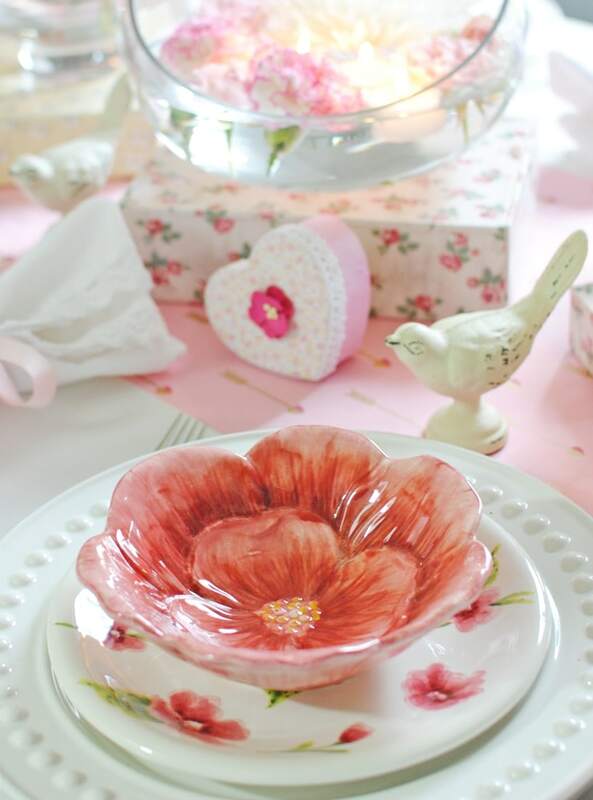 It’s the perfect setting for a Valentine Day table decoration if you ask me! Since our bed is a king size, the duvet cover is just the right size for our dining room table and! On both long ends, I pin it up in the center for drama. You certainly don’t need the same duvet as I have from Shabby Chic Couture and can do it with any bedspread that you might have. I shopped my home and brought the PINK CHIPPY BENCH in to replace our usual dining chairs on one side. Don’t you just love that vintage look? 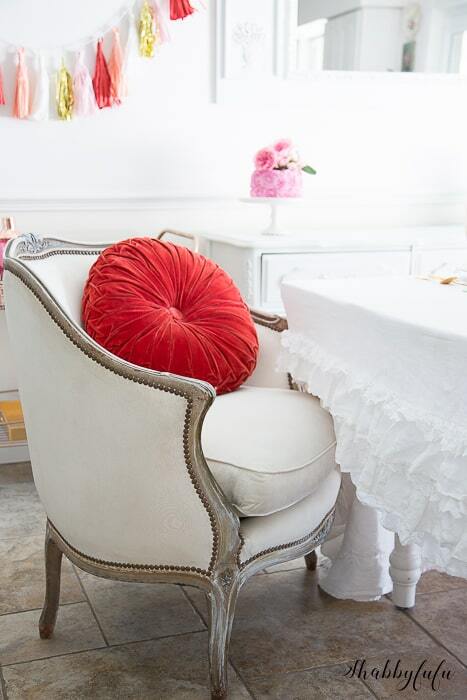 Next came the authentic French Bergere Chairs that I put at both heads of the table. They are so comfortable and I need to remind myself to bring them in here more often! They just scream romance, right? 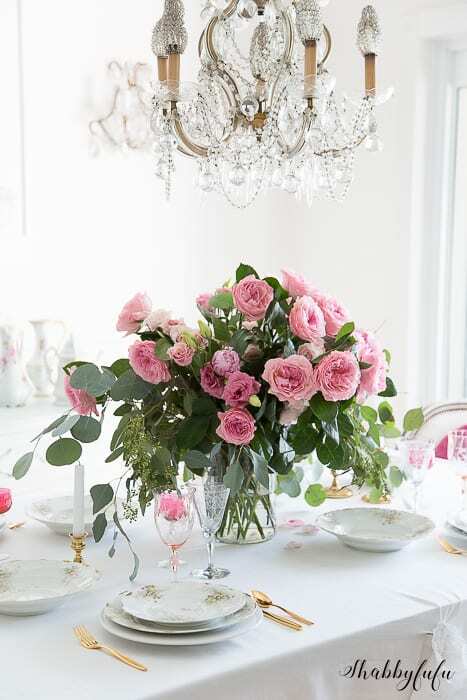 Bringing in a pop of bright or light pink flowers is the perfect way to tie in the Valentine Day table decorations. 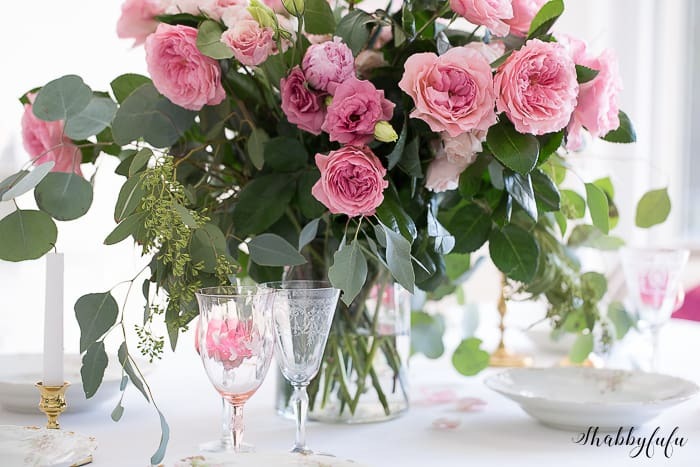 The flowers are some of the most exquisite ruffled garden roses that I’ve perhaps ever had! 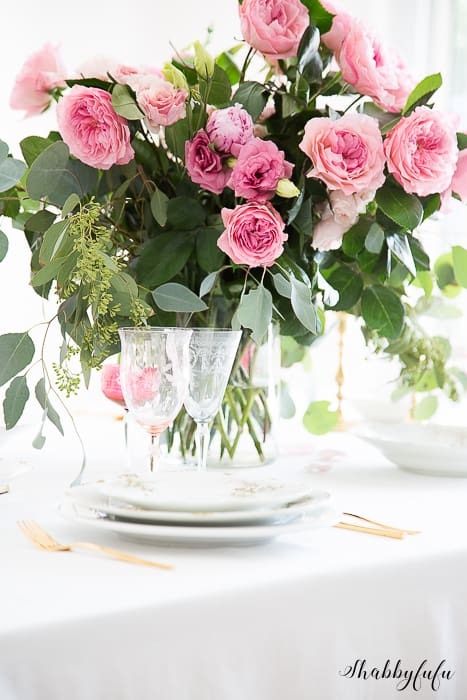 There is a new flower shop here in the Miami area that I’ve had the pleasure of working with. If you are anywhere local, I hope that you check out the Miami Flower Market. 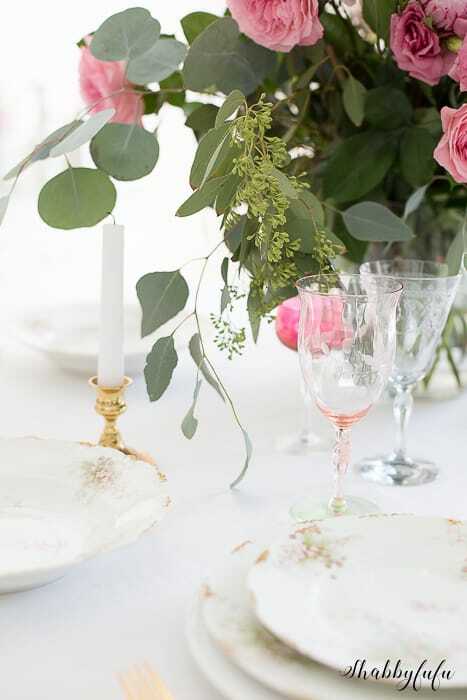 I layered my antique French Limoges dinnerware, since I was bound and determined to keep this table light and airy. Much of what I have in my home is vintage, including these pink pastel wine goblets along with the etched wine glasses and even the gold flatware. 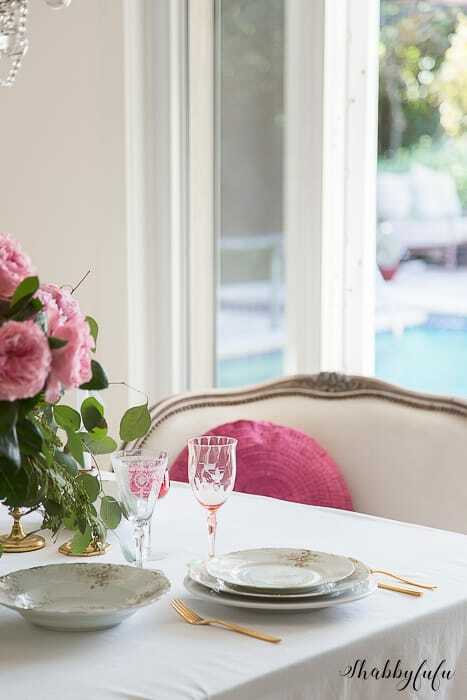 I’ll include some similar sources at the end of this post if you are looking to get your table ready for spring. 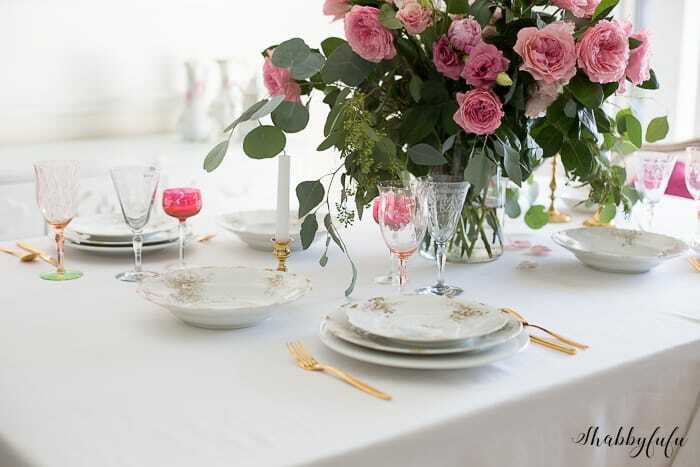 See how the layered look of the plates looks so elegant and classy? As I always say, add what you love and what makes you happy! It’s your table and your holiday to celebrate after all! 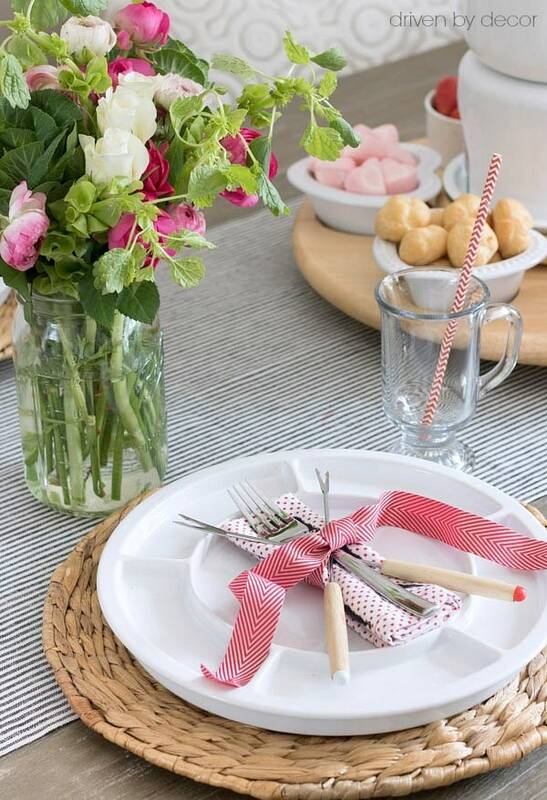 Add some fun treats to your Valentine Table as well! 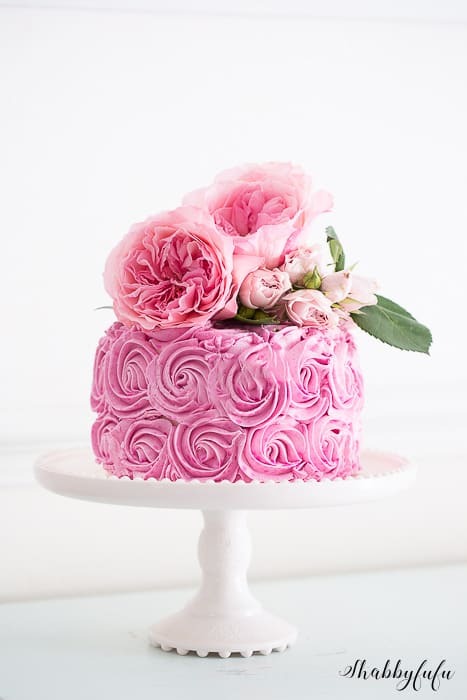 A store-bought cake with a few blooms on top elevated to new heights by a vintage pastel pink cake stand. I don’t claim to be the world’s best baker (although I DO enjoy baking:-) and often purchase plain cakes to dress up pretty. 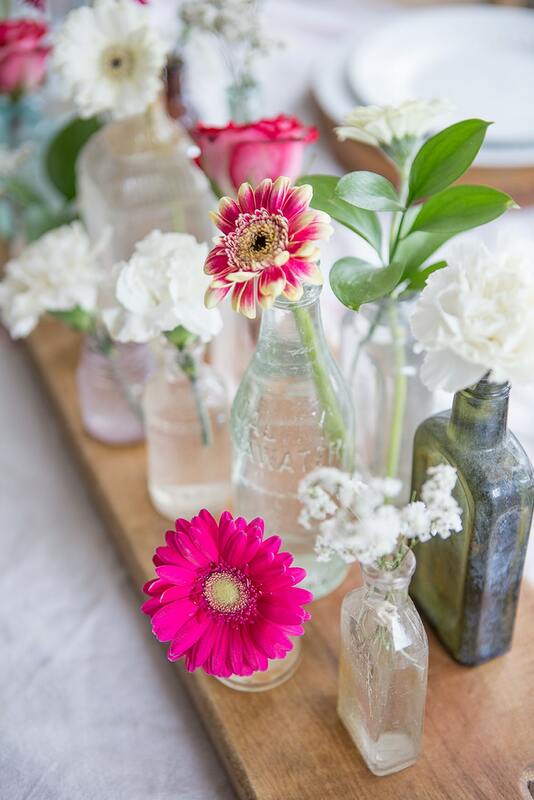 Can one have too many colored flowers throughout the room? I think not! 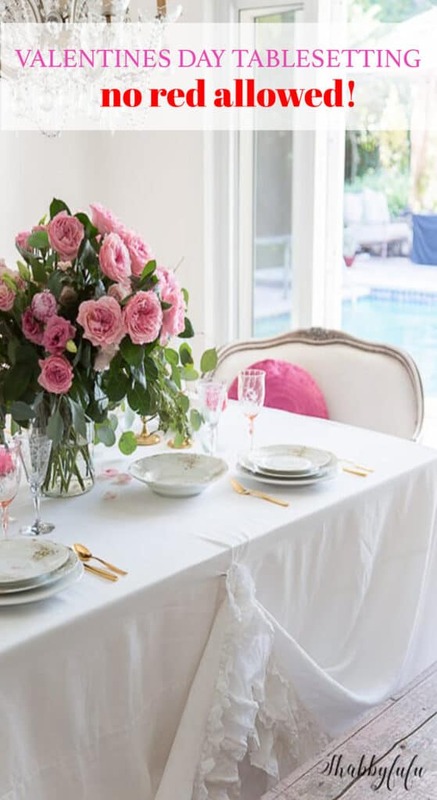 With these simple tips, you will have amazing Valentine Day table decorations with ease! And no red! Next on the tour is ELLA CLAIRE and I’m so thrilled to be sharing with these amazing blog friends all week long!